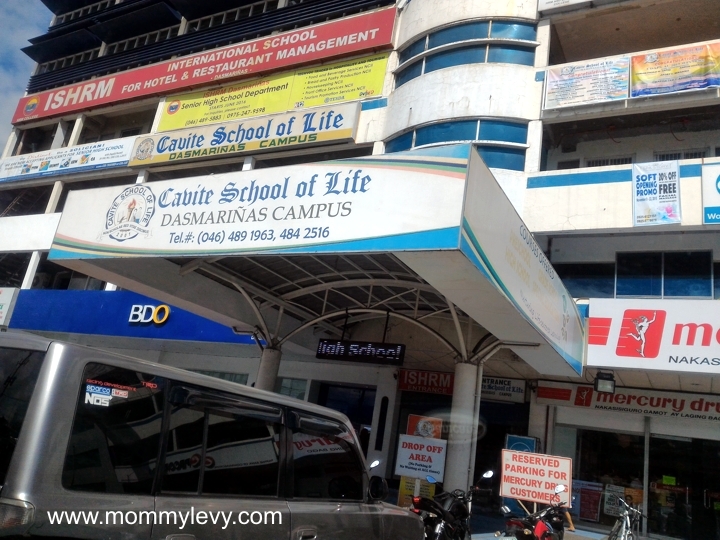 Last Monday, my friend and I visited the Cavite School of Life Dasma Campus at Salawag Crossing Dasmariñas City, Cavite. It was just a few blocks away from The District Dasma mall along Molino Road. We went here to inquire about their mainstreaming/special education program. We met the Principal and he explained to us how the kids in the mainstreaming program were being handled. The ratio for typical kids plus mainstream kids were usually 25:2 (which means 2 mainstream kids out of 25 students). He said that after the initial evaluation, the kid will be given an Individualized Education Program (IEP). This is an advantage for us parents with special kids because IEP will spell out our child’s learning needs, the services the school will provide and how progress will be measured. Compared with my son’s current school, we don’t have an IEP so we just need to follow, adjust and do whatever the school wants us to do. I asked how the typical kids adjust to the needs of the kids under the mainstream program. He said that at the start of the school year, the special kids are introduced to the class. Everyone are expected then to understand and treat each other with high respect. They were doing this for many years and he said that they did not get any issues about it. They also talk to parents about the school rules with regards to this kind of program. the hall. It’s so clean right? they have a automated ID system that will inform or txt the parents when their kid/s arrive and leave the school premises. this elevator is open when needed. It’s a one way transport from the 5th floor (where the gym is located) to the ground or main area. this is the huge gym and recreation area. It’s windy here. the stage at the gym where they usually use for graduation purposes. the stairs to the 2nd floor. Glad that it doesn’t look slippery. I hope to receive some feedback from parents who have their kids here so that we will have an idea on the school’s curriculum. Hi Mommy Susana, first of all this is not my school. I just reviewed it po. Sa may Salawag lang po yung school, at mukhang malapit lang kayo. Please visit them to inquire for the requirements. Thank you. Ask ko po kong magkano na po ang tuition fees for jhs csol dasmarinas?. Hi, Mommy Levy! This post is almost a year old. I’d like to know if you did enroll your kid in this school? If yes, is it worth it? I have an 8 yr old special needs son, too and I’m currently searching for a school for him. Would you know if the school accepts PWD cards so we can get discounts? Thanks much for your immediate feedback. yes my son studied here for 1 year. Okay naman ang school, it’s just that we decided to homeschool him na lang this year. The tuition fee is around 70-80K excluding books. Hi Mommy, you said that your child is currently home schooled.may i know the details of it? Im choosing if im going to enroll my son in csol or home school na rin. Need your recommendation Mommy. Thank you. we are under International British Academy homeschool department. Sa kanila namin binili ang curriculum. Hi! Do this school have a branch near Lancaster New City Cavite? Hi! Thank you Mommy Levy!, i first learned about csol becuase of your post.My son is turning grade 1 this school year.So far, i am very satisfied with the discipline and the dedication that the teachers have. They are pounding the kids more on the academics but still with a good balance on extra curricular activities. Hi! How much ang tuition pag SPED? How much din ang miscellaneous fees? Do you know how many hours per day ang pasok if 4 years old palang ang student? Hi po. Thank u s blog mu mommy, almost everything n basic gusto ko malaman nandito na. May idea din b kayo if ung tuition is 1 time payment or pede monthly? Hi how much po incoming senior .. I can’t answer your question, better go there and ask. Hi po! Just want to ask if they require shadow teacher? hi po pwede pong magtanong kung magkano po yung tuition para sa grade 10 student? And do you know any christian schools or non sectarian near lancaster that has quality education? Thank you very much. Your blog is very helpful to a lot of mommies. CSOL in salawag is a Christian School which offers a quality education to refar students and moreover to SPED, i am a mother of a 15 y.o boy with autism, grade 8 now in CSOL, and praise God! He is doing well and he loves the school. Mommy levy magkno po ulit tuition fee d2 sa CSOL for senior high at pti po books? maybe around 50-60K pataas po, for books I have no idea po. ask ko lang po if yung 50-60k is for year na po? Hi CJ, sorry but I have no idea. Better to visit the school and inquire. Thanks! My daughter is kinder 2 and I paid 4800 for her books. For regular students it’s around 49K and above excluding uniforms and books. Hi good pm po. Just want to know po kung dun po ba sa bacoor branch nila may sped program pa rin po? Thanks! is this also a school for kids w/ autism? they have a SPED area and area for typical kids. If the special kid can handle the regular program they will include him/her to the regular sched and it’s called mainstreaming. Did anyone knows what requirements they need if I transfer my daughter. She is in grade4 at RABBI CHRISTIAN INSTITUTE. My son studies here, he’s currently Senior Kinder…we just transfered. Traditional teaching na sila agad, hindi na binebaby ang mga bata kaya mas maagang nagmamature at nagiging independent. Advance ang turo nila, well compared sa pinanggalingang school ng son ko. Also, 15 students per class lang sa K2 kaya natututukan, unlike sa ibang private schools na over-crowded na. Strict sila when it comes to school rules and regulations which is a good thing, to discipline both the parents and students. I was impressed by how organized they are as well as sa programs na meron sila para sa mga bata, to be able to develop them in all other aspects. So far, yung mga mommies na nakausap ko from iba-ibang levels (may anak na high school, elementary, and preschool), puro positive feedback ang naririnig ko. I was so happy na nilipat ko rito anak ko, sana noon ko pa nadiscover tong CSOL. the school looks fine naman. Wala pa lang ako kilalang naka enroll dito kaya I can’t give feedback sa turo nila. Tuition fee includes fieldtrip,t-shirt for every activity,adaptation program and recognition fee is included na din… ilike also the free monthly parenting seminar w/refreshment. Hi Mommy Levy. I’ve been school hunting for my incoming Grade 1 child and Cavite School of Life is among a few I visited recently. My child has taken the assessment and the personnel (Grade School Coordinator and Guidance Counselor, among other staff) I spoke to have so far been kind and accommodating but straightforward about their teaching/education standards. I felt good when my child expressed eagerness to transfer and study in this school as we were walking in the hall on our way out. I’ve also read comments to your other post (http://mommylevy.com/2013/04/list-of-preschools-at-molino-cavite.html) from other moms/parents whose kids study in Cavite School of Life and their feedback are generally positive. So right now, it’s my top choice for several reasons. But my family still has some time to decide which school my child will enroll this school year, so I hope to hear more about this school from you as well as other parents (readers of your blog). thank you for commenting. I like Cavite School of Life, it’s my second choice for my son as of now. Hi mommylevy, can you share what’s your first choice? Hi mommylevy! How old is your son now and is he currently enrolled on mainstream? Hi Jen, my son is now 11 years old and we are homeschooling him.